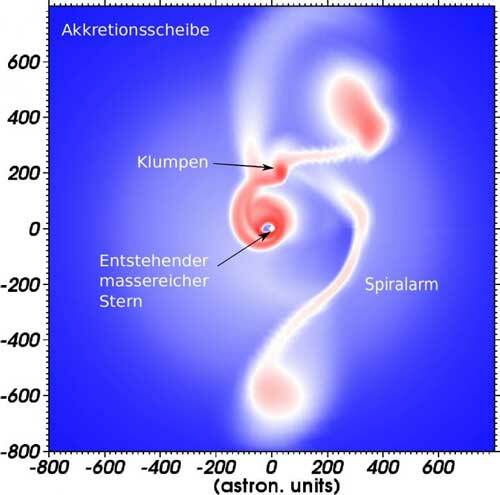 (Nanowerk News) The birth of massive stars is still a mystery to us, because these stars are embedded in an extremely dense medium of gas and dust, says Rolf Kuiper, the leader of the Emmy Noether Research Group for Massive Star Formation, funded by the German Research Foundation (DFG). "This opaque envelope makes it difficult to directly observe the birth process even with modern telescopes. In other words, we see the cradle in which these stars are born, but we can't detect the stars themselves." Therefore, the researchers modeled the birth process within a numerical simulation. For this ambitious, computationally expensive study they made use of high-performance computers within the bwHPC initiative of the state of Baden-Württemberg. The simulation starts with a cloud of gas and dust, which collapses under its own gravity and eventually forms a so-called accretion disk around the hot young star. The material in such a disk rotates around the central star and slowly transports gas and dust towards it. For the first time, the resolution of these simulations was sufficient to infer the formation of high-density clumps within the gravitationally unstable disk. Once formed, these clumps start to migrate through the disk and finally sink into the central star. "Like throwing logs into a fireplace, these episodes of clump consumption produce violent luminosity outbursts outshining the collective effect of one hundred thousand Suns", says Eduard Vorobyov. A similar process of episodical luminosity bursts was already known with respect to the formation of the first stars in the Universe and for low-mass stars like our Sun. The new investigation suggests now that the formation of stars of any kind and epoch are controlled by the same universal processes: "It is amazing to see these similarities, as if star formation on all scales and epochs is controlled by a common DNA forged in the early Universe", says Dominique Meyer, the first author of the study ("On the existence of accretion-driven bursts in massive star formation") and post-doc in the Emmy Noether Group. The clumps, explains Wilhelm Kley, are also excellent candidates for the formation of Solar-type companions to massive stars: "These companions will also influence their future evolution." The results will help to develop new observing strategies for detecting these luminosity outbursts - and even for directly imaging the high-density clumps in accretion disks around very young massive stars. This will be a task for modern observing facilities such as the Atacama Large Millimeter Array (ALMA) of the European Southern Observatory (ESO) or the future European Extremely Large Telescope (E-ELT).